The Faculty of Liberal Arts and Professional Studies (LA&PS) has launched a new initiative, now underway, that provides opportunities for undergraduate students to engage in research projects directly supervised by professors. 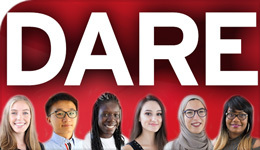 In this inaugural year, the Dean’s Award for Research Excellence (DARE) was won by 36 student researchers. They will each receive $5,000 and will work with professors on their research projects during the summer term. Politics Professor David Mutimer’s research on popular culture, particularly the intersection of video games and militarization, is one of the many DARE projects to which students applied. Criminology Professor Natasha Tusikov’s research also delves into the digital. Combatting inequality and inequity is also in line with Equity Studies Professor Elizabeth Brulé’s research project on Indigenizing the academy. Crawford graduated in Spring 2018 with a double major in International Development Studies and Communication Studies. For a view of the broad range of projects and the participating students, view the LA&PS DARE student gallery. To learn more about the details of the research projects, visit the DARE research projects listing.